All on ground floor: Living room. Dining room/kitchen. 3 bedrooms: 1 double, 1 twin, 1 single. Bathroom with bath, shower cubicle and toilet. 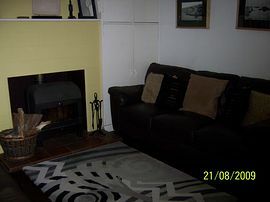 Woodburners in living room and kitchen and open fire in double bedroom (initial fuel inc). 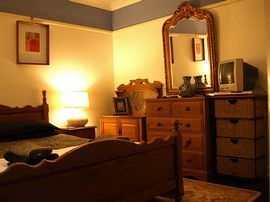 Elec CH and elec inc (£40pw Oct-Apr). Bed linen and towels inc. T-cot. H-chair. DVDs and small library. CD. Elec cooker. M-wave. Washer-dryer. D-washer. F-freezer. Tel-incoming calls only. Large grassed area and furniture. BBQ. Parking (2 cars). No smoking. Holt Forest and adjacent Holt Wood are two separate areas of ancient woodland which form part of the 488 hectare Holt Heath National Nature Reserve, which also includes one of Dorsets largest remaining areas of lowland heathland. Holt Heath National Nature Reserve is designated a Site of Special Scientific Interest; so this is a wonderfully diverse location for wildlife, walking, cycling and riding. 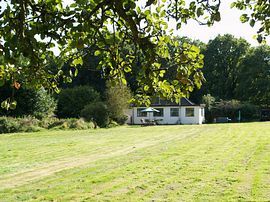 The property itself has half an acre of lawned garden to enjoy. Within easy driving you will be able to explore the south coast, which boasts the Blue Flag beaches of Bournemouth, Poole, Jurassic coast, (UNESCO World Heritage Sites) and the Isle of Wight. Other attractions on offer include Brownsea Island, Bovington Tank Museum, Corfe Castle, Longleat, New Forest National Park, Monkey World, The National Motor Museum at Beaulieu, Stonehenge and Avebury (UNESCO World Heritage Site). Pub 13/4 miles, shop and post office 31/4 miles. Idylically situated down a no through track of Holt Forest. Ideal touring location for beaches and holiday. The cottage is single storey. However there is a step into the cottage and also the shower. Sadly, the traditional door widths will not accommodate a wheelchair. 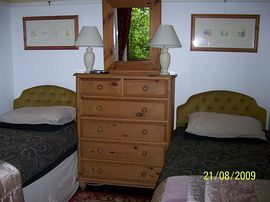 The cottage is therefore not suitable for wheelchair users or people with limited mobility. Linen and Towels. Please bring your own beach towels. Well behaved pets are allowed (subject to prior arrangement with owners). There is a charge for each pet at £20 per week. Village Shop and Post office 3 1/4 miles. From Wimborne take the B3078 Cranborne road towards Cranborne. Go over the river bridge out of Wimborne and half a mile on turn right into Furzehill Road signed to Furzehill and Holt. Go through Holt Village, past The Old Inn and round a sharp left hand bend. Turn right into Pond Head Road and follow for approx. 1 mile and turn right signed Queen's Copse Lane. Keep going right and you will find Oakleigh a quarter of a mile down on the left. See map. Please phone Mr & Mrs Stalker on 01725 514462, 01258 840463, 07930556694 or 07956 675276 a few days prior to your holiday to arrange key collection and advise of estimated time of arrival. 1st Comment: Quiet setting, surrounded by trees and fields. We visited many pleasant and interesting places. Sept 2010. 2nd comment: Quiet surroundings, plenty of wildlife. Sept 2010. 3rd comment: Property was secluded with huge grounds but near enough to Wimborne for shops. Loads of wildlife especially birds. Location was excellent for day trips along Dorset coast. Would suit family & kids equally as well as a couple. Property is 2 bedroom cottage with a huge extension for kitchen-breakfast room, plus 3rd bedroom & large bathroom. Very pleasant having breakfast while watching local birds in nearby trees. Nights are very dark (no light pollution) thus stars are fantastic to see. Bring a book on British birds and stars! Aug 2010. Note to Guests: We now provide books on British Birds and stars for your enjoyment. 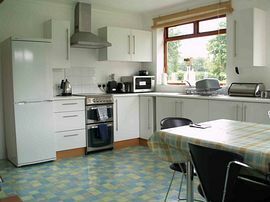 4th comment: It has all the facilities you could possibly require, including dishwasher and even a small library. April 2010.